3/123 David Mumpower The genius of this movie is that walking the same path as the previous ghost writer, Ewan McGregor's character realizes he is facing a bad end yet he cannot stop researching the events anyway. Roman Polanski is easily one of the most controversial names in filmmaking. His past crimes - and stalwart refusal to face up to his sentencing - has caused no end of debate amongst people who simply cannot reconcile their revulsion for his actions with his indescribable talent. But when he does make movies, there is always something worth talking about. In the midst of the media storm surrounding his September 2009 arrest and detention in Switzerland for his long ago crimes, The Ghost Writer was in post-production. After being briefly put on hold, Polanski completed the film from the Swiss villa where he was serving his house arrest, and The Ghost Writer made its way into international theaters in early 2010. 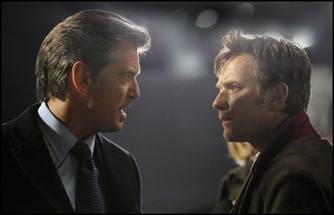 Based on a novel by Robert Harris (and with allusions to the political reign of British Prime Minister Tony Blair), the story follows a successful ghostwriter (Ewan McGregor) who is tasked with completing the memoirs of former British Prime Minister Adam Lang (Pierce Brosnan). It's a project that seems fraught with peril - the ghostwriter's predecessor died in an accident while working on the memoirs, and on the day the ghostwriter arrives, a British cabinet minister accuses Lang of war crimes. The ghostwriter quickly realizes that his predecessor might have uncovered too many clues with regards to Lang's covert involvement with the CIA, and that the lost manuscript the man left behind probably has the clues to the dark secret.